Following the fatal shooting of 13-year-old Ahmad Sharaka, Al Jazeera spoke to Defence for Children International - Palestine. "If you follow the rhetoric of Israeli leaders, if you listen to their statements, it is clear that soldiers and settlers have been given the green light to shoot Palestinian children," Ayed said Abu Qtaish, accountability director of DCI-Palestine. Palestinian factions will a rally in front of the Red Cross Committee building in Gaza City today to protest against Israel's conduct in the wake of the recent unrest. Hamas, Islamic Jihad and other leftist factions will participate in the rally, which will start at 07:00 GMT. Al Jazeera correspondent is reporting that Israeli naval boats opened fire on the coast of Rafah in southern Gaza Strip. A Palestinian man has been shot dead by Israeli security forces near Lion's Gate in East Jerusalem after he reportedly attempted to stab a security officer, according to Israeli police. The security officer was not injured, a police spokesman told Al Jazeera. A funeral for 13-year-old Ahmad Sharaka, who was shot and killed by Israeli forces yesterday, is expected to take place at Al Jalazon Refugee camp around 09:30 GMT. Ahmad was protesting near Beit El when he was shot in his neck with live ammunition. The Israeli security cabinet met last night to discuss measures against the northern branch of the Islamic Movement in Israel. Prime Minister Netanyahu reportedly instructed legal officials to formulate an evidentiary basis for outlawing some figures in the movement in the coming days. Earlier, the PM’s office issued a statement in which the northern branch of the Islamic Movement in Israel was accused of incitement against Israel. Israeli police in the southern region of Naqab have arrested Yousef Abu Jamea, the head of the Islamic Movement, and seven other activists. A Palestinian woman has been critically injured by Israeli fire after she allegedly stabbed a policeman in Jerusalem. 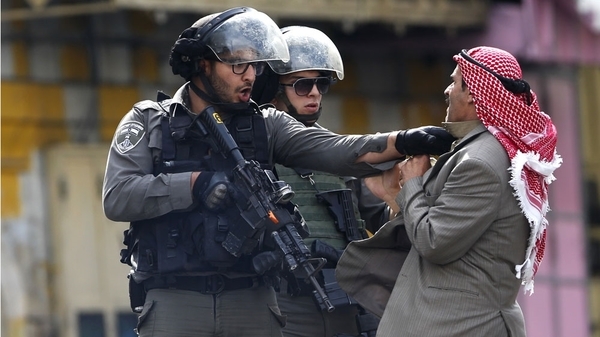 VIENNA, Oct 12, 2015 (AFP) - Palestinian foreign minister Riad al-Malki on Monday accused Israel of seeking to spark "a third intifada", as violence again flared in Jerusalem, the West Bank and the Gaza Strip. "(Israeli Prime Minister Benjamin) Netanyahu wants to instigate a third Intifada. 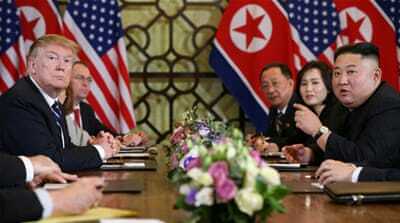 He wants to avoid problems that he is facing in the political and diplomatic arena, where he has failed miserably," Malki told AFP in Vienna. UNRWA, the UN refugee for Palestinian refugees, has called for "political action" to end the ongoing wave of violence gripping the occupied Palestinian territories. 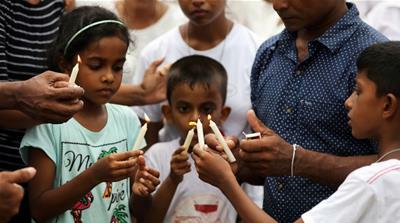 "Where alleged violations of international law occur, there must be a prompt, impartial, effective and thorough investigation of the events and full accountability in accordance with international standards," the UN agency said in a statement. Via Haaretz: Twenty Palestinians broke through the fence in the southern Gaza Strip, at the same location as Saturday. Israeli forces are responding, and are currently closing in on their location. Israeli forces are currently spraying protesters at the fence with gas, and shooting live rounds into the air. Local media: Israeli PM Netanyahu calls for investigation into Palestinian legislator Haneen Zoabi for her comments calling on Palestinians to carry out a "popular uprising". Local media: Three Palestinian citizens of Israel - all children - arrested by police in Umm al-Fahm, for allegedly throwing rocks. Prime Minister Netanyahu blames Palestinian legislators in the Knesset for protests spreading throughout Israel. "neutralised," Israeli police say. 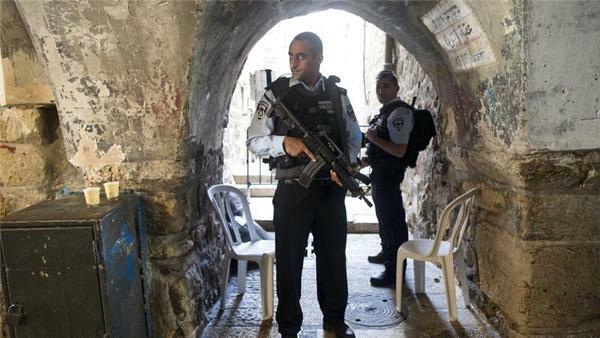 It was the 21st stabbing attack in Israel, Jerusalem and the occupied West Bank since October 3, according to AFP. Stabbing attack moments ago in raanana Near Minicipality in the center of town. 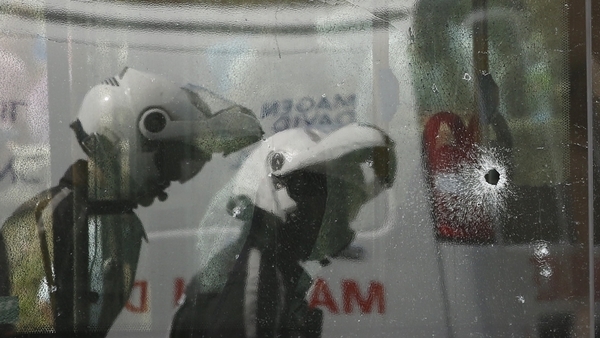 Attacker captured at the scene. One person injured lightly. More on the incident on the bus in Jerusalem: It seems that it was a gun attack and not with a knife as previously reported. Two attackers have been shot dead by Israeli police and 16 passengers were injured, six seriously according to the DPA news agency. 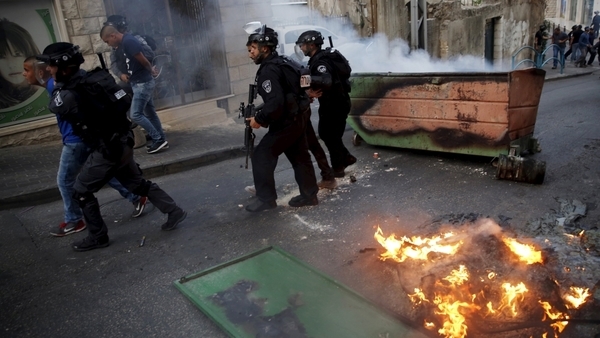 An Israeli is believed to have been killed in today's gun attack on a Jerusalem bus. In a separate incident, five people were wounded after they were rammed by a car. Read our report for the latest on this morning's events in Israel and the occupied Palestinian territories. Al Jazeera's Hoda Abel-Hamid, at the Qalandiya checkpoint in the West Bank, says a few protesters have arrived and set up their position. A couple of soldiers have fired a couple of volleys of tear gas. There's also tension in other West Bank areas, including a protest in Bethlehem called by the Fatah movement. There are also protests ongoing in Jenin and Hebron. And in Gaza hundreds of Palestinians are clashing with Israeli soldiers near the Erez crossing, in the northern Gaza Strip. 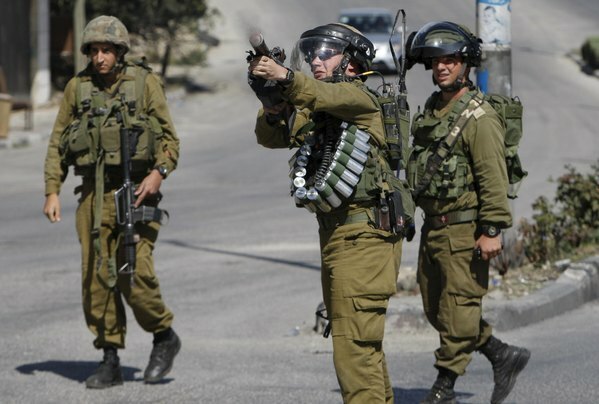 Gaza medical sources say five Palestinians have been wounded as soldiers fired tear gas and rubber bullets. Gaza's Hamas rulers have praised a pair of separate stabbing and shooting attacks in Jerusalem that killed two Israelis and wounded several others. Israeli police says two attackers stabbed and shot people on a bus. One of the attackers was killed and the other wounded. 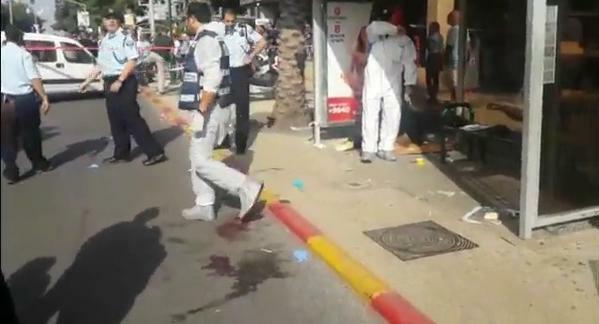 Almost simultaneously, another Palestinian rammed his car into a bus stop and stabbed people there. 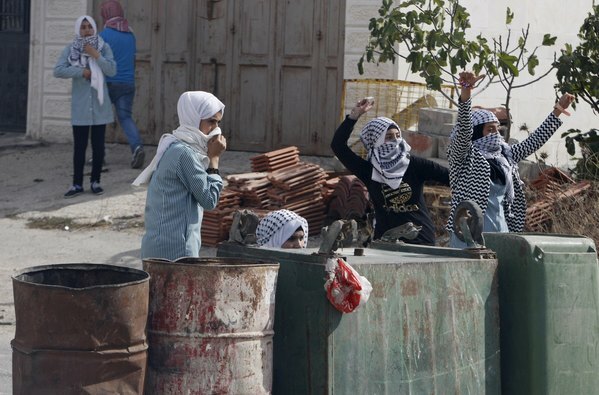 Reuters posted these pictures from clashes in the West Bank city of Hebron. A Jewish Israeli man stabbed another Jew in northern Israel in a suspected failed revenge attack, according to Israeli police. Meanwhile on Tuesday, a Palestinian was killed in clashes with Israeli security forces in the West Bank city of Bethlehem, Palestinian medical sources said. The death of Moataz Zawahra, 28, takes the number of Palestinians killed this month, including alleged attackers, to 29. Security cabinet imposes strict new measures as PM Netanyahu vows to take "aggressive steps" to stop ongoing violence. 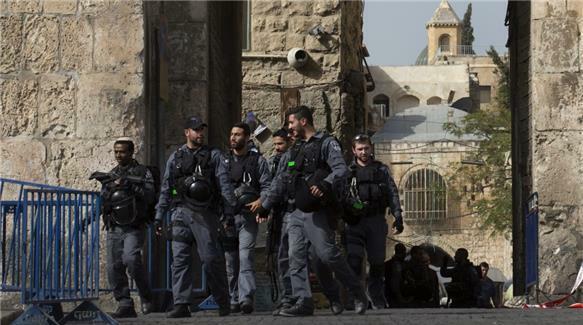 A Palestinian man has been shot and killed by Israeli forces at Damascus Gate in Jerusalem. Israeli police claimed the man attempted to stab Israeli policemen. The Palestinian president said Israel's "rejection" of peace and continued building of Jewish West Bank settlements are to blame for the current wave of Israeli-Palestinian violence. 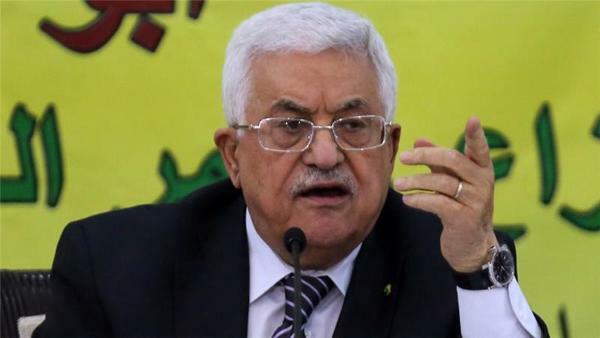 President Mahmoud Abbas said in a televised speech on Wednesday that peace and stability will only be achieved if Israel ends its occupation of Palestinian territories. He also threatened to submit a case to the International Criminal Court against what he called Israel's "extrajudicial killings" of Palestinians. Al Jazeera sources: Death toll rises in occupied Palestinian territory as Israeli forces killed two Palestinians on Gaza border during Day of Rage. Since the beginning of the month, the death toll in the latest bout of Israeli-Palestinian violence in 36 Palestinians killed and seven Israelis. A Palestinian man was shot and wounded in East Jerusalem after attempting to stab an Israeli citizen, according to the Israeli military. In a separate incident in Hebron, the army said an Israeli settler opened fire on a Palestinian man after an alleged stabbing attempt. It is still unknown whether the Palestinian has survived. UPDATE: The Palestinian man who was shot by an Israeli settler in Hebron after an alleged stabbing attempt early this morning has died, sources tell Al Jazeera. UPDATE: The Palestinian man was shot in East Jerusalem this morning after he allegedly tried to stab an Israeli citizen, has died, an Israeli police spokesman said. The Israeli was not injured, he added. We're getting reports of yet another incident in Hebron in which a Palestinian woman allegedly tried to stab an Israeli soldier. 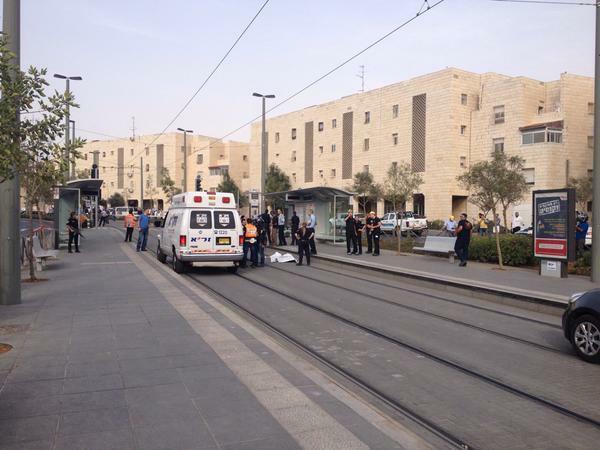 The Palestinian woman was shot and likely killed after the attempt, according to our correspondent in Jerusalem. HEBRON UPDATE: A Palestinian woman was killed in Hebron by Israeli forces, according to Israeli police. The woman reportedly approached a border police base, drew a knife and stabbed and lightly wounded a female soldier, who in return opened fire a killed her. Israeli police have sealed off the city of Hebron by blocking road access after violent clashes broke out between Palestinian protesters and Israeli forces following the killing of two Palestinians. Israeli police say the Palestinians, a man and a woman, tried to stab Israelis in separate incidents before they were shot dead.